The TRX Home2 is the company’s latest addition to their growing lineup of suspension trainers. Over the years, they’ve offered several different models, each with subtle upgrades and varying asking prices. The Home2 is marketed as the ultimate portable home gym system, letting you exercise at home, on the road, or even outdoors. But in a market filled to the brims with home fitness equipment making similar claims, can the TRX Home2 hold its own? This in-depth review will provide a close a look at what the Home2 is all about and see whether or not it’s a smart investment. Let’s start with a brief history lesson on TRX and suspension training in general. What’s The Deal With Suspension Training? If you’ve never used a TRX or similar suspension trainer before, you might be curious what all the fuss is about. It seems like they kind of exploded on the scene about 10 years ago. Now, you see them everywhere from local gyms to professional sports teams’ training rooms. But why? Although what we think of as suspension training really hit the popular scene in the early 2000’s, suspension training has been used in one form or another for hundreds of years. Rock climbers and gymnasts have been well known for performing bodyweight exercising on different hanging apparatus to improve their respective crafts. More recently, suspension training has become popular because it doesn’t require much equipment and it can pretty much be done anywhere. Oh yea, it’s super effective too. The idea behind it is that you are using your bodyweight as the resistance while performing different pulling or pushing movements on a set of handles attached to ropes. While this sounds simple enough, in reality it’s quite challenging. The handles (being attached to ropes) are very unstable. This means it’s up to you and your muscles to provide the stability necessary to perform whichever move you are attempting. This forces you to use a lot more of your stabilizer muscles for each move, especially your core. Let’s use the push up as an example. Doing a standard wall push up, the wall doesn’t move, so you are primarily working your chest, triceps, and delts. Doing a similar push up exercise with a suspension trainer is going to cause you to activate your rotator cuff and core muscles significantly more because of the instability of the handles. Long story short: you work more muscles and improve core strength with every exercise. The fact that a suspension trainer (like the TRX Home2) really only consists of a rope, handles, and an anchor makes it easy to use pretty much anywhere. Suspension training is also very versatile- you can find a way to work any body part and do pretty much any exercise with one of these systems. The combination of versatility, effectiveness, and portability has made suspension training what it is today. Well, that and the creation of TRX. TRX (Total Resistance eXercise) was created by a former Navy Seal by the name of Randy Hetrick (who also has an MBA from Stanford by the way). He came up with the original idea when he was trying to find a way to stay fit while on missions- and like that, TRX was born. TRX suspension trainers hit the market around ’04-’05 and have become an overwhelming success story. Now they are found in homes and gyms around the globe. As I mentioned earlier, the Home2 is their latest version. All of their suspension trainers really consist of the same parts: anchor, strap, and handles. The difference between their models is found in the details. The Home2 system comes with 2 anchoring options: door or suspension. By the way, the anchor is what you connect your TRX to so you can use it. The X mount (purchased separately) also gives you the ability to mount your Home2 to the ceiling or any other surface other than a door. Ceiling mounts come in handy because you get a little more range of motion, but the X mount is meant for permanent placement- so if you plan on using your TRX at home mostly and you have high enough ceilings, could be a smart investment. The door mount can be used with any door sturdy enough to hold your body weight. You simply attach the door anchor to the strap via the carabiner and place the anchor over the door and close it. Helpful hint: if the door opens toward you, place the anchor near the hinges to ensure you don’t accidentally open the door during exercise. The suspension mount can be used on pretty much any surface strong enough to hold you: trees, fences, jungle gyms, or installed bars. The suspension mount attaches to the strap the same way. You simply wrap the other end of the strap around your anchor point and fasten the other carabiner to the mount. The straps for all the TRX’s are pretty much the same, and that’s not a bad thing. They are lightweight and durable and can handle weights up to 1400 lb. The Home2 has an upgraded pinstripe webbing that is suppose to improve control and durability. The length of the strap is adjustable. After all, we’re not all the same height and not all of our workout areas are the same size. Having the ability to custom fit your TRX makes a big difference. 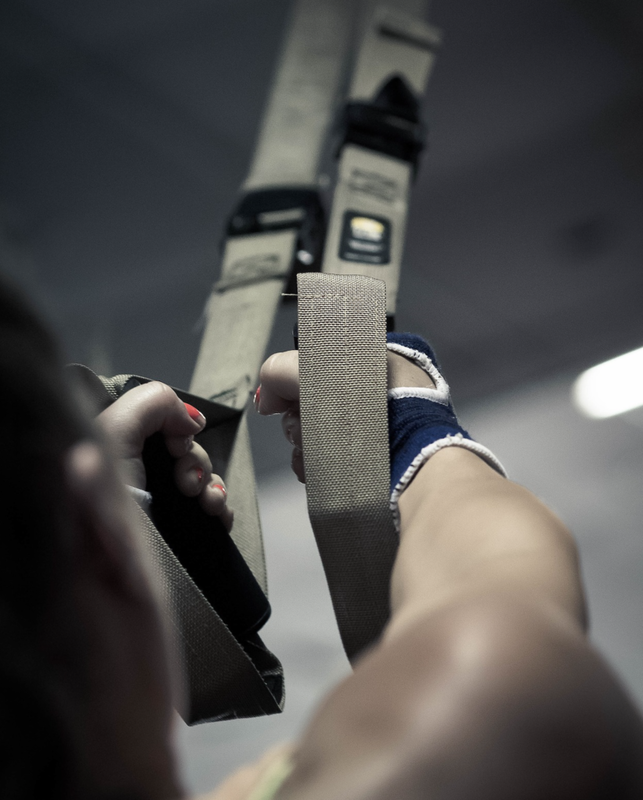 Speaking of workout area, TRX recommends a floor space of roughly 6′ x 8′ to perform all exercises comfortably. Depending on what exercises you are doing though, you can get away with less space if necessary. The handles are where we tend to see a lot of the differences between models. The handles on the Home2 have been upgraded with the addition of foam padding, which should make your workouts a little more comfortable. Doing exercises like push ups actually puts a good amount of stress through your hands and wrists, so the extra padding is a good thing. TRX has also made the foot cradles adjustable to ensure a comfortable fit for people of all shapes and sizes. If you’re doing lunges or planks and your feet are sliding around in the cradles, it’s going to effect your performance. Having the ability to personalize the size should ensure this isn’t an issue. The Home2 comes with a 5 year warranty when purchased directly from TRX. This is a pretty solid warranty on a product in this price range. As solidly as everything on the Home2 is built, it’s doubtful you’ll run into issues, but it’s always good to know you have a little insurance in case something does go wrong. The Home2 is TRX’s newest suspension trainer designed for (you guessed it) home use. Of course when it comes to TRX, home use includes your living room, your backyard, the beach, the local playground, and pretty much anywhere you can find an anchor point. The Home2 doesn’t include any huge brand changing features. Instead, they took a great suspension trainer and added a few little upgrades to make the experience more enjoyable. Like the old saying goes- “if it’s not broken, don’t fix it”. The upgraded handles and adjustable foot cradles are a nice touch. Access to the fitness app is actually a nice upgrade as well- it’s basically like having a personal trainer with you to lead you through your goal oriented workouts. For those of you who already have an older model, I see little reason to upgrade to the Home2 unless your current TRX is starting to show signs of wear and tear. If you’re looking for your first suspension trainer, TRX has earned their spot as the gold standard and the Home2 is a safe bet.